Tick bite fever is a relatively common illness in South Africa, particularly as the weather warms and ticks become more plentiful. Known by its Latin name, Ehrlichiosis, this infectious disease first gained attention as a significant disease when military dogs returning from Vietnam during the 1970’s were found to be infected. 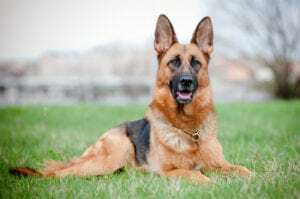 The disease seems to be particularly severe in German Shepherds and Doberman Pinchers. Ehrlichiosis is transmitted to dogs through the bite of infected ticks. The brown dog tick, Rhipicephalus sanguineus, is the main carrier of the Ehrlichia organism in nature, though other tick species have also been shown to transmit Ehrlichiosis in dogs. Ehrlichia are bacteria which infect white blood cells. The disease cannot be spread from dogs to humans but humans can contract it if they too are bitten by ticks. Signs of Ehrlichiosis can be divided into three stages: acute (early disease), sub-clinical (no outward signs of disease), and chronic (long-standing infection). In areas where Ehrlichiosis is common, many dogs are seen during the acute phase. Infected dogs may have fever, swollen lymph nodes, respiratory distress, weight loss, bleeding disorders, and, occasionally, neurological disturbances. This stage may last two to four weeks. The sub-clinical phase represents the stage of infection in which the organism is present but not causing any outward signs of disease. Sometimes a dog will pass through the acute phase without its owner being aware of the infection. These dogs may become sub-clinical and develop laboratory changes yet have no apparent signs of illness. The sub-clinical phase is often considered the worst phase because there are no clinical signs and therefore it goes undetected. The only hint that a dog may be infected during this phase may be after a blood sample is drawn, when the dog shows prolonged bleeding from the puncture site. Dogs that are infected sub-clinically may eliminate the organisms or may progress to the next stage, clinical Ehrlichiosis. Clinical Ehrlichiosis occurs because the immune system is not able to eliminate the organism. Dogs are likely to develop a host of problems: anaemia, bleeding episodes, lameness, eye problems (including haemorrhage into the eyes), neurological problems, and swollen limbs. If the bone marrow fails, the dog becomes unable to manufacture any of the blood cells necessary to sustain life (red blood cells, white blood cells, and platelets). Signs of other organ involvement can appear in the chronic form, especially kidney disease. 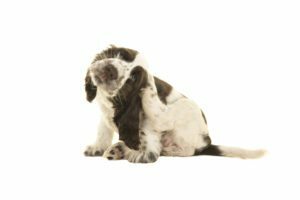 It may be difficult to diagnose infected dogs during the very early stages of infection. The immune system usually takes two to three weeks to respond to the presence of the organism and develop antibodies. Since the presence of antibodies to Ehrlichia canis is the basis of the most common diagnostic test, in the early stages of disease dogs may be infected yet test negative. Testing performed a few weeks later will reveal the presence of antibodies and make confirmation of the diagnosis possible. Ehrlichiosis responds well to treatment with the antibiotic Doxycycline. Improvement in symptoms is usually very quick, but several weeks of treatment is usually needed to ensure a full recovery. In severe cases where blood cell counts are very low, blood transfusions may be needed. Reinfection is possible, as immunity to Ehrlichia bacteria is not long-lasting. Preventing exposure to the ticks that carry Ehrlichia is the best means of preventing ehrlichiosis. Check your dog daily for ticks and remove them as soon as possible (it is believed that ticks must feed for at least 24-48 hours to spread Ehrlichia). This is especially important in peak tick season (summer) or if your dog spends time in forests or tall grass (consider avoiding these areas in tick season). Ask your veterinarian or EberVet Vetshop for advice on the best tick protection products for your pet. Over-the-counter supermarket brands may not provide adequate long-term protection. Can I get tick bite fever from my dog? No. However, humans can get canine ehrlichiosis from tick bites. The disease is only transmitted through the bites of ticks. Thus, although the disease is not transmitted directly from dogs to humans, infected dogs serve as sentinels to indicate the presence of infected ticks in the area and may be a source of the organism for infections in humans or other dogs. There have been a larger than usual number of cases of erlichiosis in the Strand/Somerset West area. If your pet is showing any signs of symptoms of lethargy or fever, please see your vet immediately. Information collated from DVM and other veterinary sources.